This is a â€œfirst contactâ€ story. The title is a play on words. Tom Stein, the main character, is an actorsâ€™ agent in Hollywood. His stable of clients includes Michelle, who was catapulted to stardom by the unexpected success of a grade-B thriller. Unfortunately, her only asset is her striking good looks. Her acting abilities are almost nil. The remainder of Tomâ€™s stable consists of has-beens and wannabes. He nevertheless wheels and deals to get contracts for all these actors. Tom is ably assisted by Miranda, who keeps him out of trouble. Tom is also the executor for the literary estate of a deceased Polish poet, a responsibility he inherited from his deceased literary agent father. Tomâ€™s â€œfamilyâ€ includes Ralph, an aging Labrador Retriever, who lives next door but spends much of his time with Tom. An alien race, the Yherajk, have traveled interstellar distances to Earth inside a hollowed-out asteroid. They are a friendly and peaceful people, and hope to establish friendly relations with humanity. Unfortunately, they have two disadvantages. They look like a bowlful of mucus, and they stink. In fact, they communicate amongst themselves by smells rather than sound. Their repertoire of scents includes many that humans would consider absolutely vile. The Yherajk conclude that the â€œtraditionalâ€ way of making their presence known, i.e. landing a flying saucer on the White House lawn, wonâ€™t work for them. Instead they secretly contact Tomâ€™s boss, Carl Lupo, with the idea that Hollywood can help them overcome their disadvantages and achieve friendly relations. Because of his prominence, Lupo decides he cannot undertake the task personally, and hands it off to Tom, who becomes the â€œcaretakerâ€ of the Yherajkâ€™s emissary, who has been nicknamed Joshua, and who lives in a big glass jar. Tomâ€™s life is further complicated by JimÂ van Doren, a reporter for a gossip tabloid that covers the movie industry. Van Doren publishes a series of articles on Tom that cause him to lose some of his clients. Scalzi very deftly melds all these disparate elements into a story that is alternately funny and serious. He even brings in some of the ethical issues that might arise when dealing with a sentient non-human race. I thoroughly enjoyed it. Even if youâ€™re not a science fiction fan, I think you will enjoy it too. 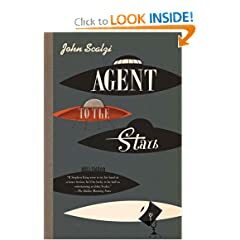 1 user commented in " Book Review: Agent to the Stars by John Scalzi "
I read this book and it is BRILLIANT, but I was GUTTED when Tom Stein dies in the last scene.